Katie Strickland prepares burrito-style spaghetti squash. She loves coming up with fresh takes on healthy food for her Katie’s Plates menus, she said. Journal photo by Lee Walls Jr.
Katie Strickland’s goal is her own show on the Food Network. She also wouldn’t mind owning a restaurant – maybe two. “I’d like to have one restaurant with healthy food and another where I can go all out with no limitations,” she said. Those may be lofty ambitions. But Strickland already owns her own thriving food business. And she’s only 24 years old. With Katie’s Plates, the Oak Mountain High School graduate offers healthy, home-cooked meals delivered in a range that includes much of the Over the Mountain area. Prospective customers can visit her website and sign up to have lunches and dinners brought to their homes Monday-Friday. Her company has grown since she started it, mostly for family and friends in the beginning, in January 2014, she said. She’s also hired a driver to help her with deliveries, she said. Strickland grew up in Homewood and attended Homewood High School until her sophomore year, she said. Her family moved to the Oak Mountain area to have room for horses. She did English eventing competitions and still has two horses, she said. Her AP English teacher at Oak Mountain High School was a Mississippi State University graduate, Strickland said, and invited students for a visit to the Starkville campus. She originally intended to become a dietitian, she said. “But Mississippi State is so focused on food service, and I took a class called Quantity and Quality in Food Production, which was about cooking for large groups,” she said. The class led to a discovery of a passion for cooking and food science, she said. Operating on the belief that many families want to eat healthy but just don’t have time to do so, Strickland started Katie’s Plates. Healthy eating doesn’t mean boring eating to Strickland. She loves tweaking recipes and making them full of flavor as well as nutritious, she said. Other recent offerings included maple-walnut crusted salmon, turkey Bolognese over zucchini noodles and strawberry-balsamic pork tenderloin. “I love to get emails from customers saying things like ‘My kids loved the spaghetti squash,’” she said. One of her creations is cauliflower cooked to look and taste like mashed potatoes. “A customer told me her husband said his favorite thing about the meal that night was the ‘mashed potatoes,’” she said. Christina Lorino Schutt, who lives in Homewood, said Katie’s Plates has helped her family through recent struggles with health issues.“I have a toddler and a 12-week-old baby,” Schutt said. “When I was pregnant, I was diagnosed with gestational diabetes. It was so convenient to know that somebody would be cooking for us and that the food would be coming right to our door.”Strickland’s dishes “taste great, are a good price and are healthy for my family,” Schutt said. However, Schutt may not be the biggest Katie’s Plates fan in the household. Donna Vaughan said Katie’s Plates has been a lifesaver for her and her husband, Dr. Tom Vaughan Jr.
“She’s charming, has a wonderful character and is just very responsible,” Vaughan said. Strickland’s success hasn’t come without demands. She works almost every day, she said, beginning to cook at noon in the kitchen at her Southside home. Her work isn’t over until at night after deliveries are made. 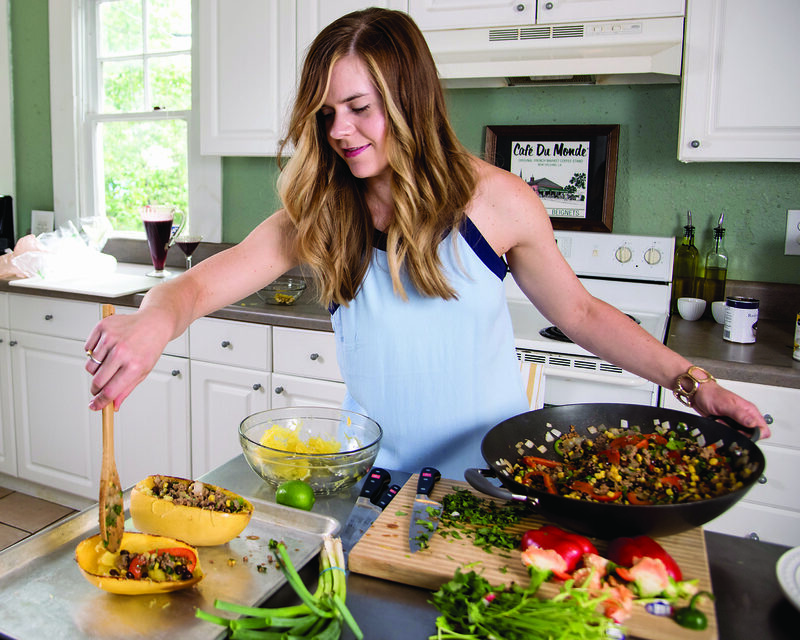 In addition to her own business, she writes paleo breakfast and lunch menus for eMeals. “That gets my creative juices flowing,” she said. She’s working toward a storefront, too, she said. Filed Under: Features, Food Tagged With: Donna Cornelius, Lee Walls Jr.